The Toyota Prius V is a larger hybrid wagon derived from the Prius liftback—the most successful hybrid vehicle ever. It was shelved in 2018 without a successor. Along with the smaller Prius C hatch, the V was part of an expanded Prius lineup that also includes the standard liftback, Prius C, and the Prius Prime, a plug-in hybrid with 22 miles of all-electric range. The Prius V shared a badge and an economical powertrain with the Prius liftback, but packaged everything in a wider, longer, taller, wagon-like body. It offered improved space for small families and their stuff while still returning respectable economy figures. Few direct rivals exist for the Prius V, but the closest competitor from another maker was the Ford C-Max Hybrid, a similarly sized, hybrid-only model that also resembles a tall wagon. It was also shelved in 2018. Toyota's own RAV4 Hybrid, however, may be the successor to the Prius V. The hybrid crossover utility vehicle has outsold the Prius V since it was launched for the 2016 model year. It offers all-wheel drive, but returns lower gas mileage than the Prius wagon—although its EPA ratings are better than those of even the most fuel-efficient crossovers in the Ford Escape and Mazda CX-5 lineups. Almost all of them are more fun to drive than the miserly Toyota, although those who like their Prius liftback but want a little more room will be pleased with the wagon. The Prius V was essentially unchanged for the 2017 model year, aside from some minor infotainment upgrades. The Prius V was the largest Prius offered, providing the most space for people and gear inside. It's aimed at small families who have outgrown their Prius liftback, but who still wanted stellar fuel economy. The V is basically a wagon version of that model, although it is wider in addition to being taller and longer. 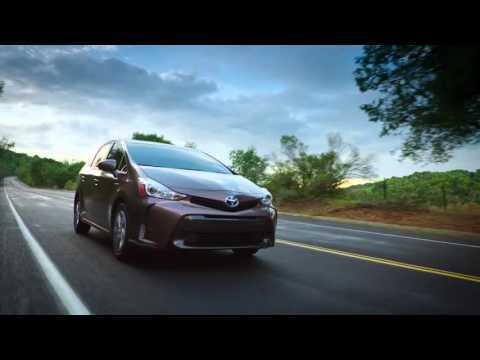 The Prius V delivered its biggest payoff in fuel efficiency. Even though it's heavier and less aerodynamic than the 50-mpg Prius liftback, it still managed 44 mpg city, 40 highway, 42 combined, according to the EPA. The Prius V used the basic formula of its siblings—a dedicated body style and the company's signature Hybrid Synergy Drive system. 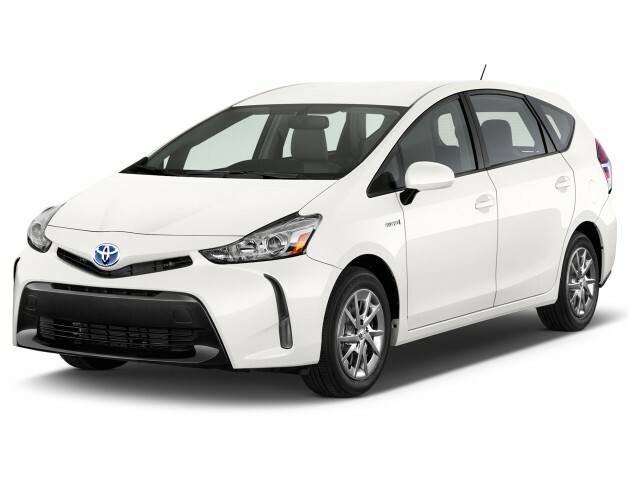 Just like the standard Prius, the V comes with a 98-horsepower, 1.8-liter 4-cylinder engine and a pair of electric motor-generators, managed through a planetary gearset and sophisticated electronic controls. Ride quality is quite good, and previously Prius-driving parents will appreciate that the futuristic, but impractical "flying console" dash layout from the main Prius lineup has been replaced with a more straightforward one that offers a variety of bins, cubbies, and trays. When compared side by side with a classic Prius liftback, the Prius V has a more classic wagon shape. The higher, squarer back end distinguished it from the long-sloping "kammback" design used for the Toyota Prius liftback since 2004. While the shape of the latter is aerodynamically superior, its low roofline at the back interfered with cargo capability. The more spacious Toyota Prius V shared no body panels at all with its five-door sibling, even though the two looked very similar. The V provided a higher (more minivan-like) seating position, along with more cargo space—67.3 cubic feet, with the rear seats folded. The rear seats also slide back and forth, and can be reclined to optimize the balance between passenger legroom and cargo space. As with all but the smallest Prius C model, the driving experience is very low-involvement. The steering is light but precise, and powertrain response will rev or slow the engine note independent of road speed, as the hybrid system continuously re-balances the mix of gasoline and electric power for maximum efficiency. It will all feel familiar to Prius owners, but wagon buyers new to the Prius line may find it a little off-putting at first. Overall, the Prius V drove much like the Prius liftback, but it's more burdened by 300 pounds of additional weight. Prius drivers will feel the extra heft during acceleration from a standstill, and new drivers will note the Prius V straining mightily to labor up hills while heavily loaded with people and their goods. The Prius V, much like the Prius liftback, comes with a series of trim levels that can seem confusing. For starters, the "V" is pronounced phonetically, as in Prius "Vee." Toyota Prius V Two, Prius V Three, and Prius V Five models were offered initially, with a Prius V Four added for 2015—no, there isn't a "One." The Two is the base model, while the Three adds Bluetooth, voice-activated navigation, and steering-wheel controls, plus navigation and a touchscreen system with Toyota's Entune infotainment interface. With the Five you get the full spectrum of goodies: upgraded alloy wheels, heated front seats, synthetic leather upholstery, foglights, and LED headlights. The Prius V received its first refresh for the 2015 model year, with new, more aggressive styling bringing the look closer to that of the most recently updated Toyota products. Some equipment was shuffled around, and the base price dropped slightly, while Toyota added the Four trim level between the Three and Five to provide an extra build and options combination. The 2017 model is mechanically identical and keeps up the original model's high fuel-economy marks. Toyota ended the Prius V's production with the 2017 model year. A new vehicle in its size class should emerge for the 2019 model year, still Prius-based, but styled to more closely fit in with the crossover class. We enjoy this vehicle, has plenty of room for a tall person, my wife enjoys the hatchback so she can load and carry a lot of stuff. The mileage and safety are excellent.